If you have ever had nail fungus, then you know it can come out of no where, it doesn't mean you're a "dirty" person, and it never wants to leave once it finds a home in your nails. It is stubborn to say the least! Many of the topical nail fungus treatments out there don't do the job, and they usually contain some ingredients that aren't safe during pregnancy. 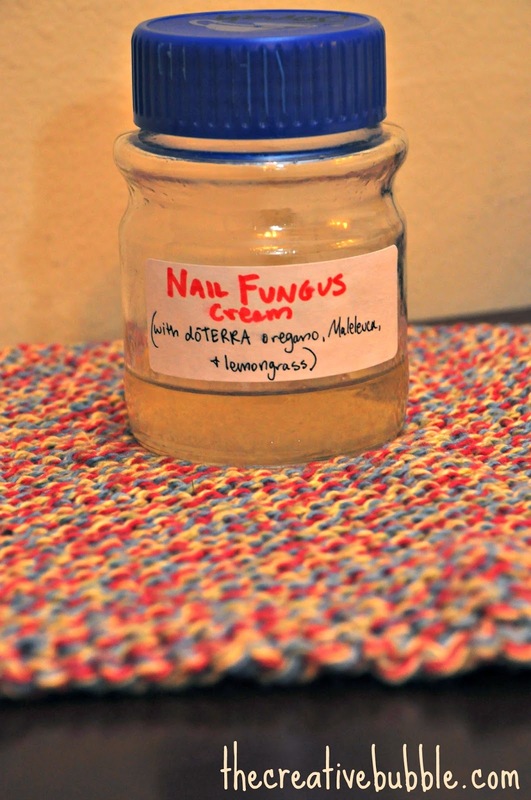 If you'd like to use a nail fungus cream that is sure to KNOCK OUT the fungus, then I recommend making your own using essential oils. This stuff is strong, and you can be confident that it will kill the fungus. Melt the coconut oil over low heat in a double boiler or just stick it in a bowl, and put it outside on a hot day. Then mix your essential oils into the melted coconut oil. It may take several days for the coconut oil to re-solidify, because of the low viscosity of the essential oils. You can see in the picture above, that my mixture is still not completely solid. Cut the infected nail down as far as you can without pain. Use a fresh q-tip to apply the cream generously to the nail, twice daily, for at least two months. It is vital to stick with it, or the fungus will just go ahead and have a party in your nail bed again. You may not see results for up to a year, because the nail has to grow out completely to fully eradicate the fungus. Dr. Weil also recommends eating 1-2 cloves of raw garlic daily, as it contains significant anti-fungal properties. Oregano, Malaleuca, and Lemongrass essential oils have very strong anti-fungal, chemical compounds. Plants have to defend themselves against bacterial, fungal, and parasitic predators, to name a few, so it only makes sense that the oils they produce, have the power to also help us to fight off these things. Oregano, for example, is such a potent anti-fungal, that it is capable of destroying resistant, mutated fungi, which result from strong antibiotic therapies. The dishwasher and washing machine are a couple contraptions I never really thought I needed to clean before I became the keeper of our home. I mean c'mon; aren't they supposed to clean themselves while they clean our clothes and dishes? It turns out that there are a lot of ways these overly used machines can get gunky. Grease, soap scum, pieces of food, etc. can coat the inside walls and corners. This can make them look dingy and smell stinky. It can also decrease their efficiency, so cleaning them about once every other month is a good idea, and may even release your inner cleaning super woman! I will be doing a post in the future on how to clean your washing machine, but today I'm going to tell you how I clean my dishwasher. -Domo is optional, but he is a good cheerleader. 1.) 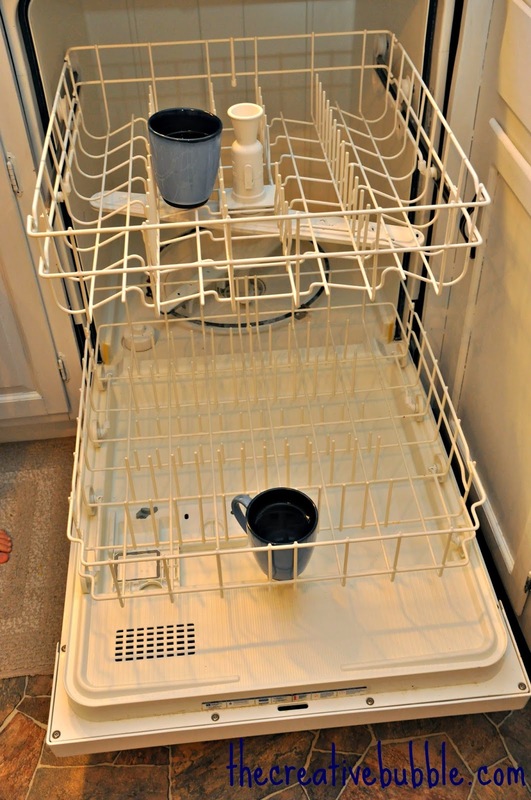 Empty your dishwasher completely, then take out the bottom rack and make sure there is nothing gross lingering down on the bottom. You'd be surprised about what you can find! 2.) Place one cup on the bottom rack and one on the top, then fill them with white vinegar. 3.) Drop four or five drops of essential oil into each cup. 4.) Turn the dishwasher on its hottest cycle, then let it run the entire time. 5.) Next, you can sprinkle one cup of baking soda on the bottom of the dishwasher floor, and run it on its hottest cycle again. The vinegar helps to get in there and loosen grease and gunk, while it sanitizes and removes musty odors. Citrus Bliss smells like Heaven, and can make your whole house (and dishwasher) smell glorious! Why not clean with boring vinegar and baking soda, and have some delicious smells going on in there, too? 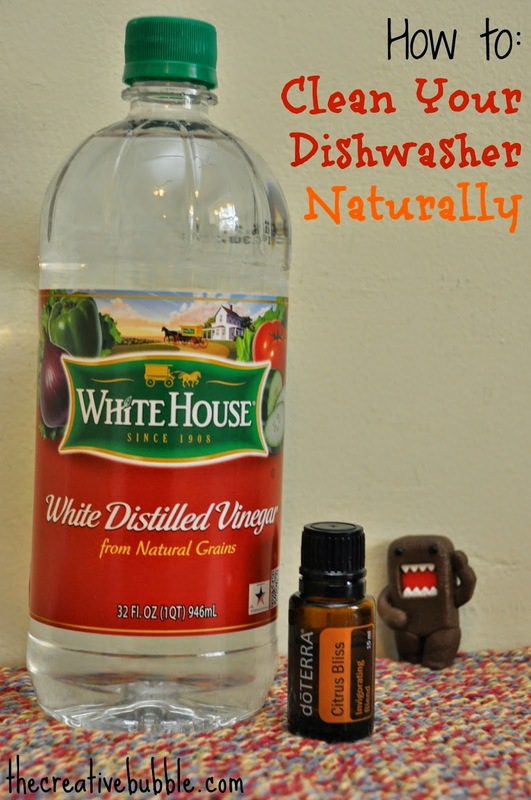 It really helps to add extra fighting power to eliminate odors in the dishwasher! The baking soda does a lot of work, too! It freshens the smell, and really brightens the dishwasher by removing the build-up that the vinegar didn't get. The two work hand-in-hand. Do you see those cute, little toes on the rug up there? Oh, how I love my little guy! My two-year old was "helping" to clean mama's dishwasher. 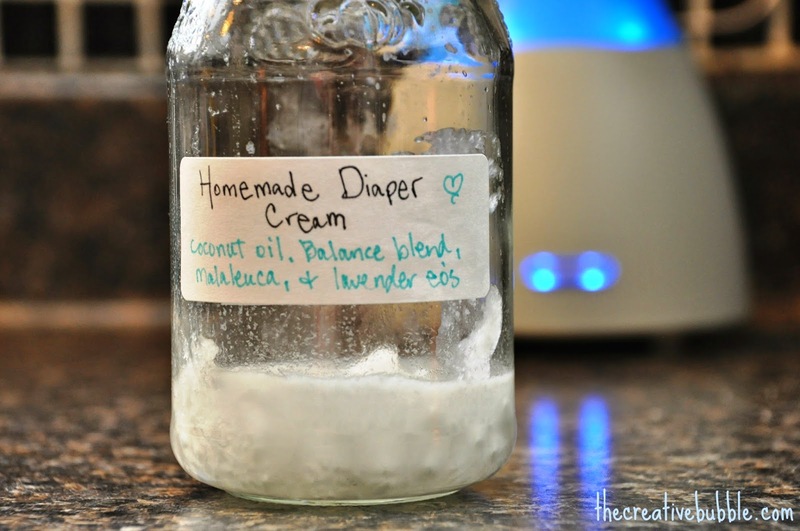 When I had my first son, it took me a while to finally settle on a good diaper cream. We literally had tubes and jars of different creams everywhere in the house. Not many of them worked. Some had chemicals in them that I wasn't too fond of. I WISH I had known that I could have very easily made my own! It looks a little messy in that jar, but don't let it sway your feelings about using something this awesome! I am in love with the simplicity and effectiveness of this recipe. In a double boiler, slowly melt the coconut oil, or you can just put it outside in a bowl on a hot day! Mix the oil drops into the melted oil, then let it solidify. For applying, I just use a q-tip. This cream can also be used for other bothersome yeast infections. So, don't worry about getting that prescription cream or all those other diaper creams you're unsure about. Just go ahead, skip it all, and give this a try. I promise you'll be glad to have a jar of this at your house! If you aren't familiar with Balance essential oil blend, here is what it looks like. It has so many uses, such as in this diaper cream and balancing mood (fighting anxiety) when used aromatically.